I’m not generally a fan of “healthy” desserts/baked goods. Mostly because I want my dessert to taste like…dessert! 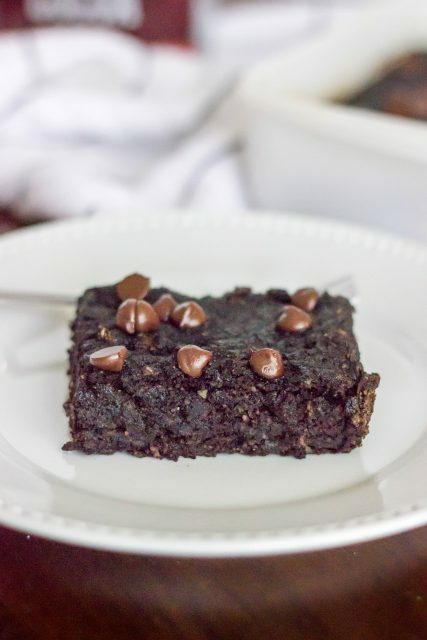 😉 But sometimes I find a recipe that is both healthier and satisfies my chocolate craving. 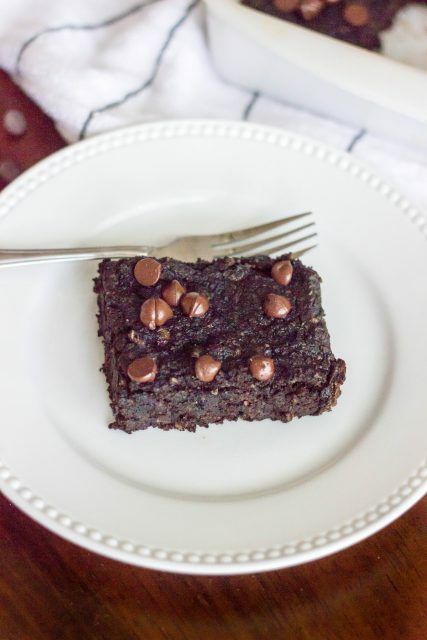 This is one of those recipes – no added sugar, perfectly moist, and (most importantly) delicious! It’s super easy without any “weird” ingredients – just almond flour and coconut flour. Make sure your bananas are very ripe, as you aren’t adding any additional sugar here, and of course, feel free to add more chocolate chips =). Enjoy! 1. Preheat oven to 350 degrees F. Spray an 8×8 inch baking pan with nonstick cooking spray and set aside. 2. In bowl of stand mixer (or in a small bowl with a fork or potato masher), combine bananas, eggs and vanilla until smooth. 3. In a large bowl, whisk together almond flour, coconut flour, cocoa powder, baking soda, baking powder and salt. Gently fold in wet mixture and stir until well combined. Next stir in chocolate chips, reserving a few tablespoons. Spread batter evenly into prepared pan and sprinkle remaining chocolate chips on top. 4. Bake for 18-23 minutes or until toothpick comes out clean. Cool completely before cutting into bars.